These Valentine cards were a simple way to create cards, not only for Valentine’s Day, but for all those February birthdays I seem to have on my calendar! The supplies I used include: blank cards and envelopes of your choice, colorful paper, a Sharpie or Micron pen, watercolors, a hot glue gun, some Washi tape, alphabet cookie cutters, tape adhesive, a pair of scissors (or heart punch), and a sewing machine. 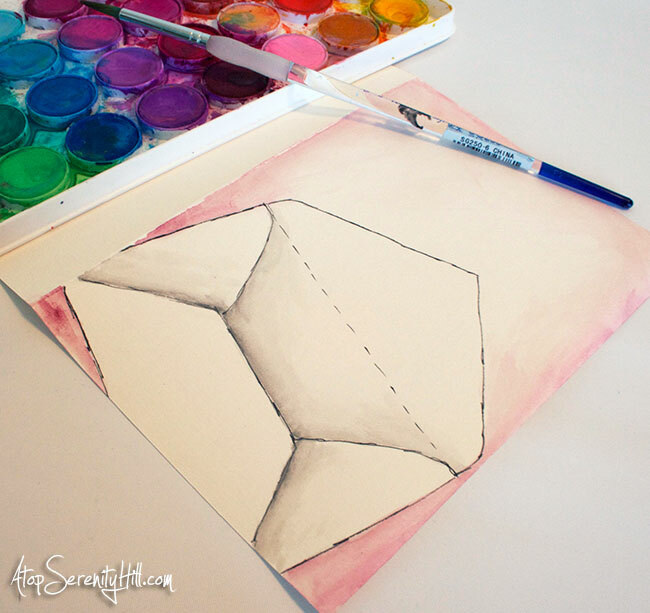 The paper I used is one of the printables from my Etsy shop. I printed it out on regular copy paper and cut out heart shapes using scissors. Any pretty scrapbook paper would work and a heart punch would make it just that much faster! This card was the fastest to produce. I added a tiny bit of tape adhesive to the back of the hearts to hold them in place. A straight stitch down the center of the hearts adhered them to the card. I then added a zig-zag stitch on the sides and a bit of pink Washi tape for extra color. I left some of the strings hanging, but that is definitely a personal preference! TIP: if you don’t have a sewing machine, you can create a similar look by using a Sharpie to “draw” on your stitches…just use a little extra adhesive to keep the hearts in place permanently. Card #2 started with a quick sketch of an open envelope with a Micron pen and then some watercolor to add shading and a bit of color to the background. 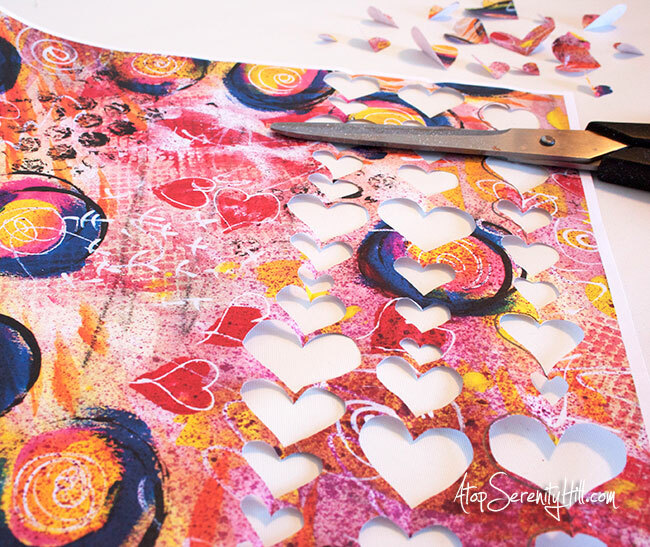 All of the cut out hearts were added with a hot glue gun. You can use any glue you like. Hot glue just happens to be a favorite of mine. I only glued down the center of the hearts so that they had dimension on the card. 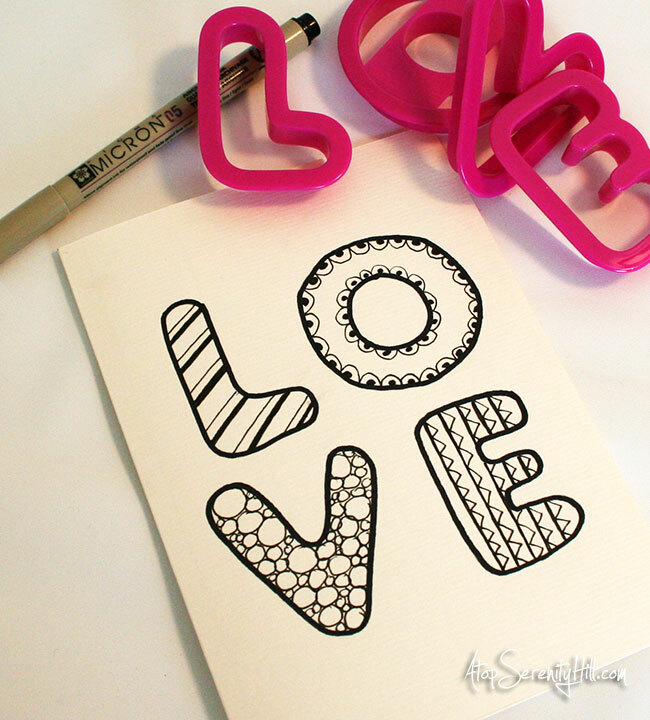 For the final card, I adding the word love using alphabet cookie cutters for the shapes and a Sharpie. The doodling in each letter was created with a Micron pen. 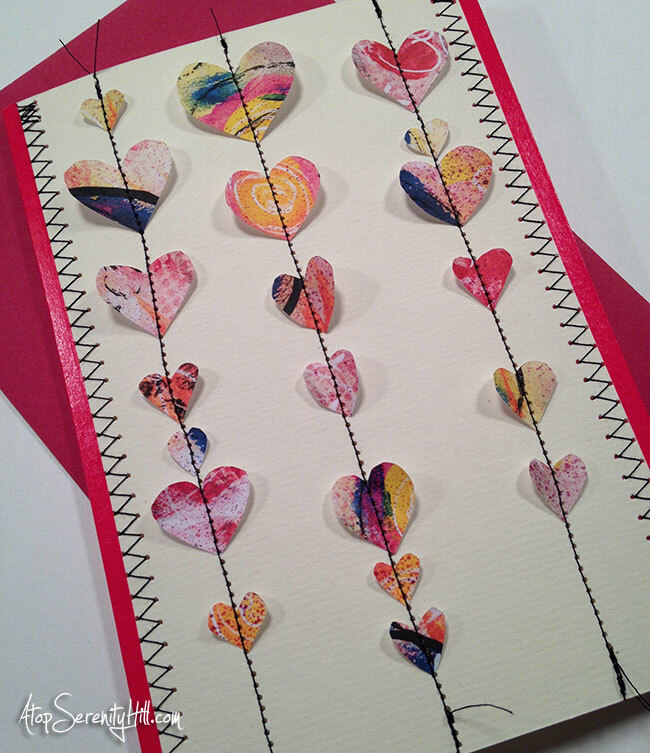 I again used my glue gun to add the hearts randomly across the card. I love that out of a single sheet of pretty paper, I was able to create three different looks! All of them were quick to complete and can be done at the last minute, if need be. I currently have a couple other printables in my Etsy shop, so be sure to visit! What a lovely idea! I love the sewn hearts, very fun! Thanks, Sal! Love the name of your website! Sweet! I love the cut out and stitched hearts. Thanks, Rita! That card seems to be the favorite! 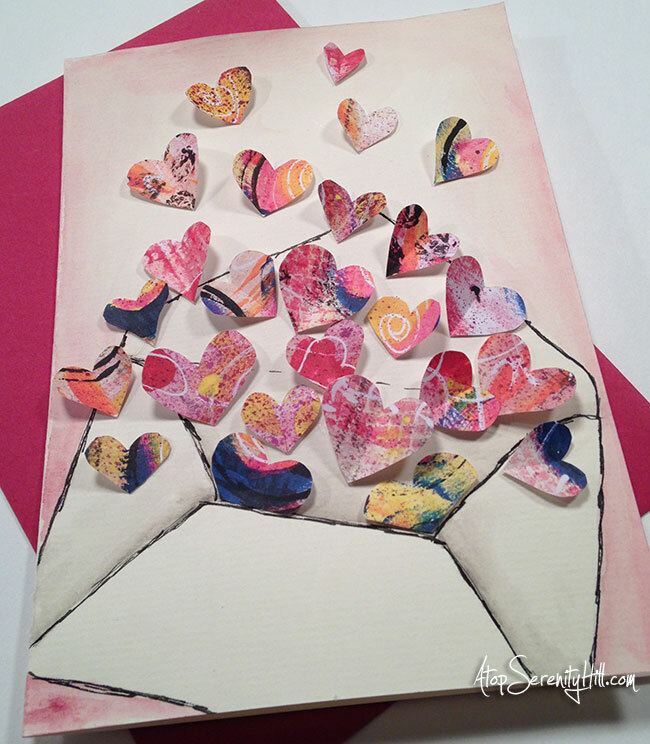 I love the card that shows all the hearts coming out of the envelope. They may be pretty simple but it is so bright and cheery-someone will be lucky to get those cards. Thanks, Erika! That was my first idea but I couldn’t seem to stop there! Hello. I was wondering what brand of watercolors you used making those heart valentine cards? Those cards are gorgeous. Hi Marykay, I’ll give you links to the paint to make it easier. I use both a cake form from Loew Cornell (http://www.amazon.com/Cornell-1021095-Simply-Watercolor-Cakes/dp/B00114RIIQ/ref=sr_1_1?ie=UTF8&qid=1422899039&sr=8-1&keywords=loew+cornell+watercolor) and pencils by Derwent (http://www.amazon.com/Derwent-Drawing-Pencils-Inktense-Watercolor/dp/B000PD3M84/ref=sr_1_2?ie=UTF8&qid=1422899067&sr=8-2&keywords=inktense+pencils). Hope that helps! These are so lovely! I adore the envelope bursting with hearts! 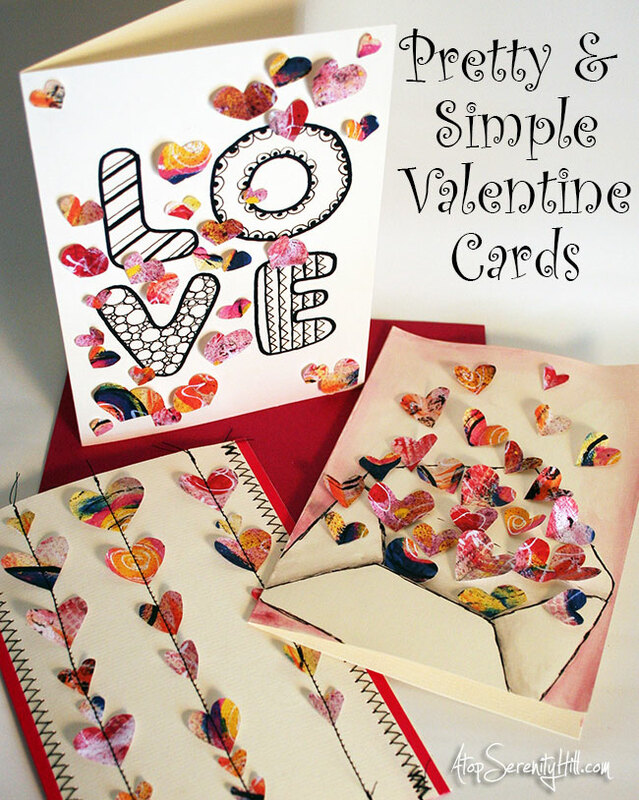 I love your cards….just goes to show what a gorgeous creation can be made with a few simple tools and a very talented creative soul in charge of them!! They are truly wonderful and thanks for the tutorial!! Thanks for the lovely compliment, Giggles! It is much appreciated! All of them are very cute, well designed and executed. You made a very clear tutorial as well. Thank you for sharing. So glad you stopped bu, Ozge! Ok, I’m completely smitten with your sewn on hearts! And the envelope bursting with hearts is to die for. What fantastic ideas. Thanks for sharing. I love cards any time of year, but these are extra special. P.S. 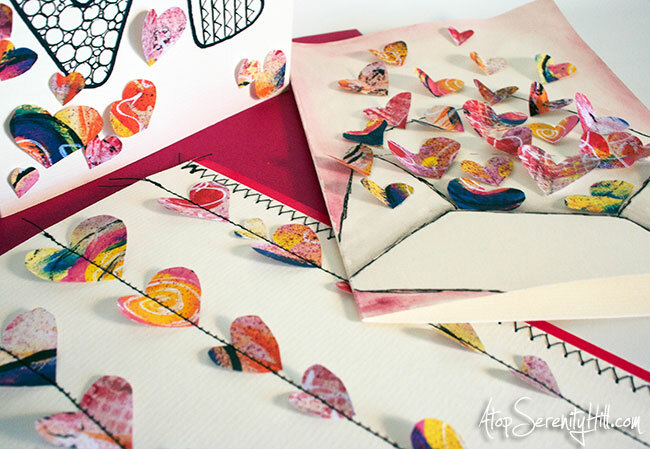 Love the colours on the heart paper. 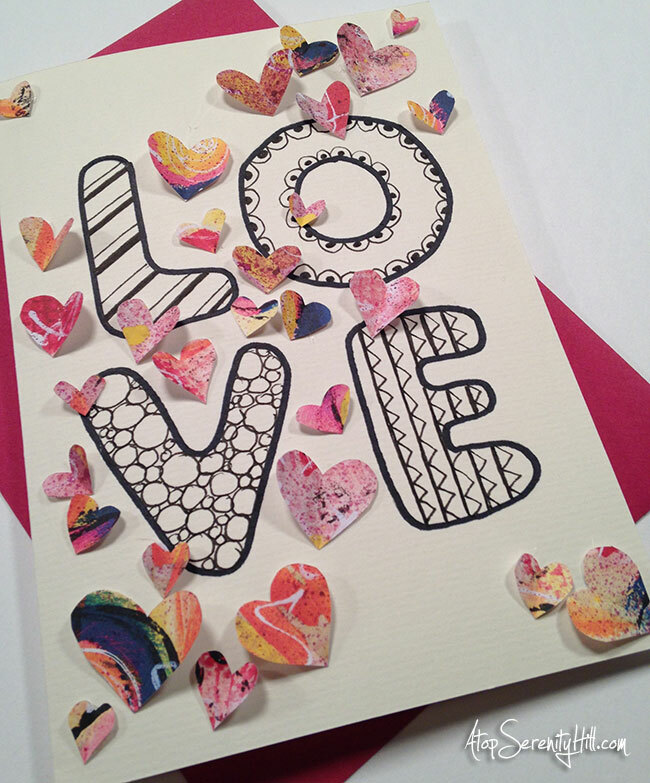 I love your cards with the colorful bursts of hearts! Thanks again for the feature and for the lovely comment on Instagram! Love these! They’re very pretty.